If you’re in the market for a new house or flat, and have been busy looking for some time, you might have noticed a couple of things. 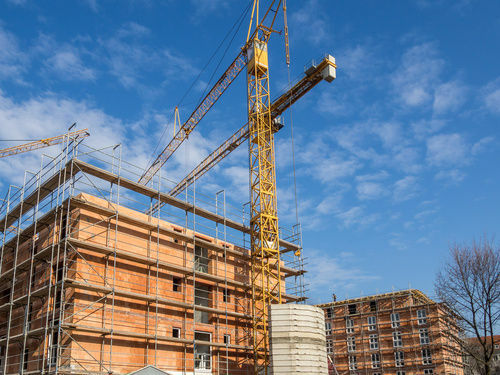 Firstly, that properties move very quickly, some before you even have a chance to book your viewing, and others, new builds, will be listed before they are even built. If you have considered moving into a brand-new home, then perhaps you may have been put off by the price tag? Brighton is a prime example of a city where there is always plenty of development taking place and there are a lot of new build apartments. If we compare the average price of a new 2bed apartment in our stock to the average price of an older home, the new build homes are higher in cost, but there are some sound reasons for this. All new homes should come with a builder’s guarantee. 80% of new properties built in the UK use the NHBC scheme, which offers a 10-year warranty. The first 2 years of the NHBC warranty mean that if the builder hasn’t adhered to technical standards and defects are found in the property, the builder must fix these at their own expense. This could be applied to problems with the interior or exterior. From year two after the home is completed, the builder is only responsible for correcting structural and weather-proofing defects such as blown render, problems with the roof and so on. This can save thousands of pounds. We all know someone whom has bought a “character” property and moved in to find that 6 months later they have a bill for a new roof! Living in a brand-new property is very aesthetically pleasing! There are no nail marks in the walls, no hideous wallpaper to peel, no bad colour choices to fix. The walls are smooth, everything is shiny and new including the appliances; the carpet is plush and stain free. You have your own blank canvas, and will probably find to start with you don’t need to do any decorating at all, and saving hundreds if not thousands of pounds that you could spend “making good” an older property. New properties are built with the environment and home running costs in mind. It’s not uncommon for apartment blocks to have their own shared solar water heating systems, meaning residents can enjoy free hot water in the summer months. All new builds have airtight, water tight windows and seals, saving hundreds per year on heating bills. They’ll be very well insulated too. Many of our customers moving to new homes tell us they don’t even need to turn their heating on for most of the year! If you buy a new-build home with integrated appliances in the kitchen, these will all be new too and will come with their own warranties. Most importantly, the boiler or water heater will be brand new too and won’t need servicing until it’s a year old. After that, your boiler or water heater should last between 5 and 10 years. With the minimum cost to replace a boiler at around £2500, that’s a saving in itself. A more human benefit to moving into a new home is that everyone that moves into the development will also be new. This means that you’ll all grow your community together. Moving into a community when it’s new gives everyone something in common from the start, and you’ll all get to know each other by asking those niggling questions like when is bin day and where’s the nearest cashpoint. Our property search allows you to search for our current new build properties in Sussex. If you’d like to be made aware of new developments in your area to buy off-plan, send your details to our Land and New Homes team at brighton@oakleyproperty.com.